Once more past the sleeping giants of the sugar beet factory. Once more along the insomniac A14 by the hyperactive Toys 'R' Us. Once more down the chop-chop-busy-busy A12. Once more into somnolent Mary's Chapel, aka Capel St Mary. Battle through the Brownies and associated parents and guardians, and slip through the secret door which leads upstairs to The Room with The Table. Waiting for us are Capel "C" (previously) with canny Dave, TractorBoy Richard and Manningtree John. Over to Yang and Ed for the doubles. 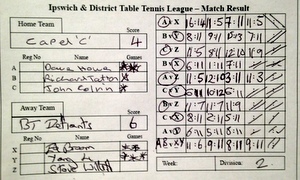 Record thus far this season has been played six, won zero, lost six so rather good to finally nail a win, both in that particular game and for an overall 6-4 victory. Must mention John's generosity in bringing along a pack of Waitrose continental dark chocolate butter biscuits. Yum.